Bill Hamilton writes “What secrets lurk in ocean depths? Are there alien forms of intelligent life that occupy the vast volumes of water that constitute our oceans, seas, and lakes?” The largest of our oceans, the Pacific, covers 64,000,000 square miles and reaches a depth of 36,198 feet, a depth that no ray of sunlight ever reaches. Could these depths hide alien submarine bases? 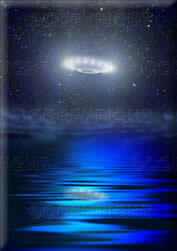 Underwater UFOs have been sighted on many occasions lifting out of their submerged depths and taking to the air. In an article entitled "UFOs - at 450 Fathoms," UFO Reporter Ed Hyde told of the sighting made by Dr. R. J. Villela, a Brazilian scientist, who saw a UFO smash through an estimated 40 feet of ice at the South Pole and soar into the sky at amazing speed. It was author and researcher Dr. Ivan T. Sanderson who suggested that aliens could remain undetected by building their bases beneath the world's oceans. 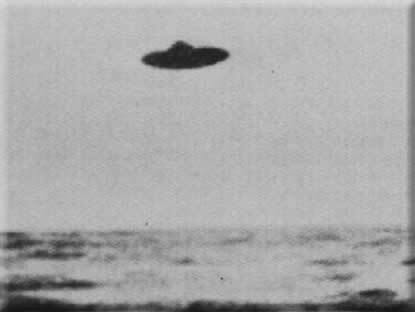 Dr. Sanderson found that by actual count, over 50 percent of the UFO sightings had occurred over, coming from, or plunging into or coming out of water. This includes oceans, seas, lakes, and reservoirs. Of the oceanic UFOs (some term them USOs or Unidentified Submersible Objects), one was tracked by the U.S. Navy near Puerto Rico in 1963. Of course many of these objects have been tracked over Puerto Rico since that time. On a training maneuver, a sonar operator detected a sub aqueous object traveling at over 150 knots! The technicians tracked this object for four days and it maneuvered down to the incredible depth of 27,000 feet. Submarines of 1963 could not dive further than a fraction over a mile into the ocean deeps. What kind of submersible could withstand the tremendous ocean pressures? And how could it overcome the tremendous resistance of water moving at such incredible speeds? Scientists still have to find irrefutable evidence proving the existence of UFOs. Hundreds of new reports on UFOs appear everyday. One percent of those reports remain a mystery unraveled though 99% of them could be explained by natural or man-made factors. Let us assume that aliens exist and visit Earth on a regular basis. What would be the best place for them to build a secret base? Seabed would be the best option. The oceans cover two-thirds of the planet. The ocean remains virtually unexplored. We have a much clearer picture of processes that occur on the Moon; our knowledge of things that happen deep under the surface of the sea is scarce. As it turns out, reports about certain mysterious undersea incidents arrive steadily. Those incidents are reported by naval officers who normally have good technical expertise and composure. The Navy officers are subject to annual medical examinations. Submarines have no skylights. Maintaining radio communication under the sea is not easy though a radio wave passes through the water a lot better than it does above the sea surface. That is why submariners largely report incidents related to strange acoustic signals. As far as we know, Earth is the most watery of planets in our particular system. Perhaps in some form water lies in or under the clouds of Venus or in the gaseous layers of the outer planets. To a small degree it is almost certainly present on Mars. But large deep bodies of water such as ours seem definitely unique in our solar system. Presumably, therefore, if our space visitors came from a neighboring planet, they would approach our lakes and oceans with wary respect. Without such watery expanses of their own, they would never feel at ease on or in ours, no matter how advanced their technical development. But the striking fact is that, where water is concerned, UFOs appear far more at home even than ourselves. They seem to regard it as an element barely distinguishable from air and, except for an apparent interest in sampling it, they treat it with indifference. They have been seen flying into it and emerging from it at full speed. 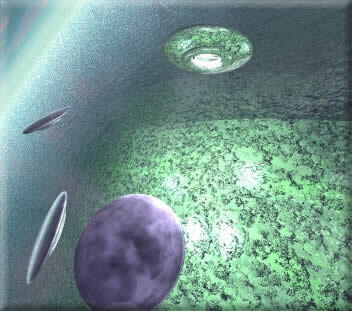 Observations of strange subsurface luminous discs suggest they may even live under it. Personally, I’ve just returned from a long Caribbean cruise and during I found myself mindlessly peering out to the endless sea many times as days go by without ports of call. 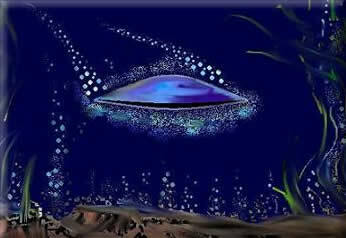 I’ve always known most of the earth is water, but until you are at sea, you never really can wrap your mind around it. If it was my duty to come to planet Earth to study for instance and keep yourselves out of site, the oceans are the obvious choice. If bases do exist here, I can bet they are right under our wet noses.